ABSTRACT: In April 2012 London’s Southbank Centre hosted a two-day festival entitled “Impossible Brilliance: The Music of Conlon Nancarrow.” A three-way collaboration between the Southbank, London Sinfonietta and Trinity Laban Conservatoire of Music and Dance, the event included what was probably the second ever performance of the complete Studies for Player Piano over ten 40-minute concerts. During the two or more years it took to develop the event it became clear that programming these works posed a great number of artistic and practical questions for which there are few existent performance traditions. The author was the instigator and curator of the festival and this essay discusses these issues and explore the solutions that emerged. The first section examines the unique qualities of the Studies in their original form and surveys the many ways the Studies have already been presented in performance and on recordings; the second is a report on the approach adopted for the festival. The article concludes with a brief discussion of broader issues of authenticity and reproduction raised by the process of curating the event to suggest that Nancarrow’s work emerged from a particular, non-repeatable historical moment. Approximately two thirds of Conlon Nancarrow’s music was conceived for the player piano, a technology that was already becoming antiquated by the time he began exploring it in 1947. Up until the personal computer music revolution of the 1980s, however, it was the only tool capable of realizing his complex musical ideas, which continually strayed beyond live performers’ technical and temporal ability. It also allowed him complete autonomy over his compositions from conception to performance, anticipating the practices of the home studio towards the end of the twentieth century. As Kyle Gann points out, it also protected Nancarrow from the usual feedback loop, “in which what we create is conditioned, in part, by the reactions we’ve received to what we’ve already created” (Gann 2014, ). While this approach enabled him to generate a unique body of work, it also severely limited the practicality of the Studies as performance pieces. Recordings of the fifty or so “Studies for Player Piano” have been a highly successful means of disseminating Nancarrow’s work; indeed they have been the primary vehicle for his modest rise to fame, but actual player piano performances of them are elusive. There is an increasing appetite for arrangements of the Studies but it seems ironic that just as Nancarrow’s chamber music, be it arrangements or native chamber works, has become embedded in performance culture, the opportunity to experience his pioneering player piano works in the way the composer did is rapidly disappearing. In April 2012 the author curated a two-day festival entitled “Impossible Brilliance: The Music of Conlon Nancarrow” at London’s Southbank Centre. (1) A three-way collaboration between the Southbank, London Sinfonietta and Trinity Laban Conservatoire of Music and Dance, the event included what was probably the second ever performance of the complete Studies for Player Piano over a series of ten 40-minute concerts. (2) This essay discusses the unique issues involved with presenting these works and explores the solutions that emerged. The first section examines the nature of the Studies in their original form and surveys the many ways the Studies have already been presented in performance and on recordings; the second is a report on the approach adopted for the festival. Detailed analysis of the works themselves is not attempted and any interested readers should refer to Kyle Gann’s excellent book on the subject (1995), as well as other contributions to this special issue by Bugallo (2014), Callender (2014), Nemire (2014), and Thomas (2014). The final section is a brief sketch of broader questions of authenticity related to Nancarrow and the player piano that arise when curating a festival such as the one reported here. Developing such a festival unsurprisingly meant being intensely practical for most of the time. All the same, it prompted considerable reflection on the exceptional nature of Nancarrow’s practice. So the concluding section is used as an opportunity to begin capturing those reflective moments. 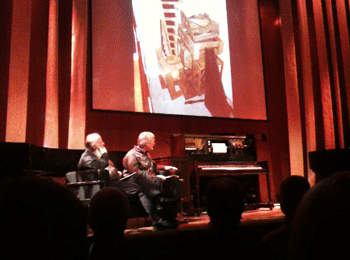 The discussion ends with the suggestion that his contribution may be regarded as a never-to-be-repeated moment in history and that while the opportunity for hearing his work “live” on a player piano rather than a recording is rare and takes enormous effort, the result is important and artistically valuable. The two player pianos that Nancarrow used for the majority of his work, plus his complete archive, currently reside at the Paul Sacher Foundation in Basel so it seems appropriate to discuss them in the present tense. (3) They are uprights which according to their serial numbers and the Pierce Piano Atlas were built in 1925 and 1926 in New York by Marshall and Wendell and incorporate an Ampico reproducing system. Fully functioning standard pianos, they are also capable of playing Ampico format rolls via a built-in electrically powered suction pump. 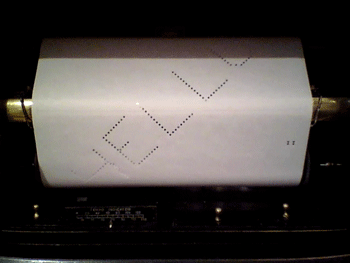 Once a roll has been loaded onto the spool, the speed that the paper will scroll past (and consequently the music will play) can be set from a slider showing nominal tempo values. 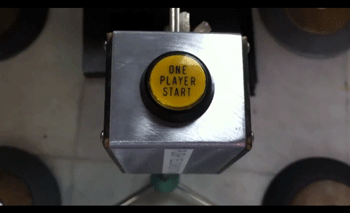 All the operator has to do is click a lever into the “on” position. The piano then plays the composition with no further interaction required and, provided the appropriate perforations are included, it will automatically reroll at the end of the piece. All instruments that play rolls can be described as player pianos, but they divide into two subgroups. Electrically powered ones such as Nancarrow’s are called “reproducing pianos” as opposed to pianolas—(a name which, like the hoover in the UK, began as a specific company’s product and over time has become adopted as a generic term for vacuum cleaner)—which are to be pumped with pedals. The crucial difference is that tempo, dynamics, and some articulation are provided by the person playing the pianola, allowing for considerable interpretation of the music, while each playing of a roll on Nancarrow’s reproducing pianos would, for all intents and purposes (providing the tempo was not changed), be identical. Dynamics on the Ampico system work by splitting the keyboard into higher and lower halves then treating each as a singular entity, so that while the two halves can have different dynamics all notes of each half are nominally of the same volume at any given moment. The mechanical accuracy of the dynamics also means that repeated notes could, if the composer so desired, be entirely consistent, even at speeds far above the ability of human players. It was designed to reproduce a sophisticated range of dynamics including crescendos and diminuendos, but Nancarrow’s dynamic language was invariably tiered into relatively simple, even crude steps. Study No. 24, for example, alternates between sections at pp and ff with no other dynamic markings for an arresting effect, while Study No. 21 uses only a few dynamic changes to help the higher voice match the volume of the lower towards the end. Study 3a is simply marked ff sempre. 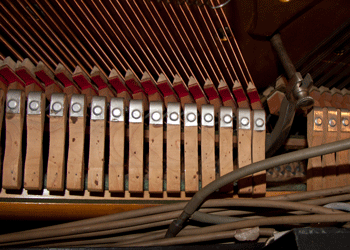 Nancarrow altered the timbre of the instruments by placing metal on the striking face of the hammers. One has a strip of metal encasing the whole hammer; see Figure 1. The other has tacks held in place by a leather strip; see Figure 2. (Various sources misleadingly state that one of the pianos simply has leather strips covering the hammers.) The timbre is noticeably different between the two, with the tacked one being preferred by Nancarrow for the majority of the Studies. This so called “tack piano” technique was well used by nineteenth-century bar pianists for a more penetrating sound, but also was something that Bach lovers, notably Glen Gould some years later, used to combine the piano’s volume and dynamics with the harpsichord’s clarity of attack. (4) In a letter to the musicologist Monika Furst-Heidtmann in 1980, Nancarrow wrote that he altered the timbre “to make the attack more precise. For the same reason that Bach sounds so much better on the harpsichord than on piano.”(5) Nancarrow also accentuated this precision by having dampers added to the full range of hammers, the upper 22 being undampened on the original model. The Studies are written almost exclusively without sustain pedal (with a couple of notable exceptions such as during the 1,000 note assault at the end of Study No. 25), so sympathetic vibrations are largely limited to any notes that happen to be sustained when another is sounded. Combined with the metal hammers this produced notes with a sharp attack, a thin sustain, and a rapid decay. Furthermore his studio, where the Studies were “born” and where the most widely heard recordings were made, had limited reverberation. Approximately 9 meters by 5 meters in size, the sonic reflectivity of the stone floor and breeze blocked walls were diminished by non-parallel surfaces, an inner ceiling made from hardboard, bookshelves, furniture, and a great deal of general clutter. (6) Nancarrow’s experience of this non-reverberant acoustic is evident in the best known recordings: the 1750 Arch ones (Nancarrow 1977) and the Wergo Collection (Nancarrow 1988), both produced by Charles Amirkhanian and recorded in the presence of the composer, on his own player pianos and in his own studio. Finally the size of the studio meant that the composer and any guests who heard the pianos were closer to the piano than the audience would usually be in a traditional concert hall. Having purchased an identical Marshall and Wendell Ampico Reproducing Piano and “tacking” the hammers, the author was able to take some loudness readings with a sound level meter. With the top open, Study No. 3a was measured at two meters as averaging 96dB (A weighting) and peaking at 99dB. Classical concerts, on average, do not exceed 90dB(A) (Petrescu 2008). Given the dynamic range of most classical music, the average is considerably quieter. In addition the sound of the player mechanism is itself quite loud and projects primarily from the front of the pianos, but once the paper leader has passed, is effectively masked by the music. While this can be lessened for recordings by placing the microphones behind the instrument, the effect for the “live” listener is not dissimilar to the relationship between needle noise and music at the start of a vinyl LP. To illustrate, Example 1 provides a film of Nancarrow’s quaint “Hello” joke recorded by the author on Nancarrow’s leather/tacked piano at the Sacher Foundation in 2010. The microphones were placed approximately one meter in front of the piano. Every Study, or movement of a Study, is punched on an individual roll, and each one takes up to a minute to reroll after the piece has finished. Removing a roll (generally tightening it by hand afterwards for safe keeping) then inserting a new one may take another minute so there can be no rapid succession of pieces on the same piano as we are used to on the recordings. The process of roll changing is in itself a gentle piece of theatre that demands its own sedate tempo in keeping with Nancarrow’s calm personality, but in direct contrast to the Studies themselves. ...in general I prefer the tape because it’s exactly the way I wanted it from my studio. The volume would not only have been closer to the dB level of the pianos up-close but would also have increased the clarity of the attack of the notes, overriding some of the hall’s acoustic signature and reinforcing the suggestion of Nancarrow’s enjoyment of the sound of the instrument with as little environmental coloring as possible. Given that classical music practitioners generally demand an acoustic that will color the raw sound of their instruments, this clearly differentiates his aesthetic. Like the two categories of player pianos themselves, there are two significant categories of player piano performances. The late Jürgen Hocker, a player piano enthusiast from Germany, gave numerous performances throughout Europe from 1987 to 2010 on his Bösendorfer Grand with an Ampico system, with Nancarrow in attendance for a number of them up to 1991. Although the hammers were also prepared with metal, the tone was not as harsh as that of Nancarrow’s own—but it apparently met with his approval. However, even in 1990 Nancarrow still seemed to favor tape when describing Hocker’s performances: “It’s strange that a very good tape of my things in the studio is probably better than this thing that this man has” (Wheen 1990, 10). Hocker later added a Fischer Grand to his collection with which he was able to perform the two-piano Studies. The MDG label has released the complete series on CD allowing us a chance to hear these versions, which though crisp and clear have a traditional concert hall ambience. It seems that Hocker’s aesthetic interest was to present the Studies in a more traditional manner, but in doing so sanitize them, increasing their perceived distance from the listener to concert standards and smoothing out the sharp edges that make the original recordings, particularly the 1750 Arch ones, so exciting and unusual. Nancarrow clearly appreciated Hocker’s support, as repeatedly documented in Hocker’s (2012) memoirs of their time together. The second category of player-piano performances involves pedaled pianolas. The two primary exponents of this are Rex Lawson in London and Wolfgang Heisig in Leisnig in the former East Germany. Both play “push-up” player pianos. These pedal-powered instruments contain roll-playing mechanisms but instead of being built into an actual piano they feature a series of wooden “fingers” which, when fitted over a normal keyboard, will play the notes of any piano. What these instruments and players bring to the Studies is, crucially, the ability to adjust tempo during performance. When he met Lawson in 1985 Nancarrow realized that the tempo flexibility that the instrument afforded allowed the player piano to function in an ensemble setting, and he was so impressed by Lawson’s mastery that he began plans for a concerto for pianola and orchestra. This was unfulfilled in his lifetime but he did leave Studies 49a, b and c as a blueprint for this work. (A number of versions of this have now been performed, including a new one featuring Lawson at Impossible Brilliance, but this story is complex enough to warrant its own essay.) Given suitable timing references, the flexible tempos also allow two players to play the two-piano Studies, something that Heisig and Lawson have done on several occasions using synchronized click-tracks. The other aspect that the pianolas bring is a more traditional sense of performance, allowing the audience to applaud an actual performer. Lawson’s opinion is that the Studies are enhanced by this aspect and without human interaction their density can otherwise render them unapproachable. Lovers of computer music however, who have commonly experienced performances played on speakers alone may be less concerned. In describing the concert experience of the studio composer’s work, Simon Emmerson writes: “although we may know it is fixed (and may have heard it before), the ritual of the performance still allows us to experience the ‘game’ of the narrative as it unfolds” (2007, 26). A number of composers have made what seems like an obvious leap by taking Nancarrow’s Studies fully into the digital domain. Robert Willey’s 1986 realization arranges the monotimbral 12-part canons of Study No. 37 into 12 synthesized voices, each having individual sonic qualities, thus allowing the ear to find the horizontal lines that combine to create the vertical texture. These are then spatially arranged over either a stereo or quadrophonic sound system as explained in Willey’s paper on the subject (Willey 2013). Martin Schlumpf’s methods on his CD (Schlumpf 2004) group timbres less rigidly, allowing the sounds to mutate more freely within the curvatures of the music. In his version of Study No. 37 each canon has its own timbral signature, simultaneously reinforcing the homophonic nature of that group of twelve voices while accentuating the contrast between subsequent ones. An issue encountered with both approaches is that of sound source: the relatively young practice of sound synthesis and the rapid changes in technology mean that, unlike the piano, certain sounds can be located in particular decades or even parts of decades. These versions are therefore not as “timeless” as the originals (but this may arguably be irrelevant). Carlos Sandoval, Nancarrow’s one-time assistant, has eschewed many of these sonic issues by concentrating on spatial structures in his 2006 multi-speaker versions of Studies Nos. 21 and 37 (Sandoval 2013). Using piano samples only, he brings the spatial considerations to the foreground, and by using systems that emerge from the pieces themselves finds a new stratum of energy hidden within the works. For example, his version of Study No. 21 places the notes sequentially around twelve speakers. The tempos of the two lines, one accelerating and one decelerating, therefore dictate the speed that the sound rotates around the listener. An almost heroic tradition has developed of pianists playing Nancarrow Studies, something that might have been considered impossible at the time of their composition. Nevertheless there is an increasing catalogue of astounding performers who include them in their repertoire. 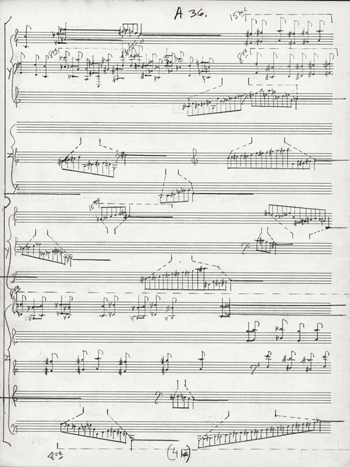 There is also a growing number of transcriptions available, including those by Yvar Mikhashoff, Thomas Ades, Erik Oña, Helena Bugallo, Amy Williams, Pierre-Laurent Aimard, Joanna MacGregor, David Appleton of Pianocircus, and Nancarrow himself. And there are now scores or recordings of Studies Nos. 3b, 3c, 3d, 4, 5, 6, 7, 9, 14, 15, 16, 18, 19, 20, 26, 32, and 44 using between two and twelve hands. Some of these, such as MacGregor’s (2011) recording of 3c, use studio multi-tracking, but most are designed for live performance. As already stated, Nancarrow’s music may be in danger of losing its provocative edge when inserted into the concert-hall tradition, but it also gains from the excitement of witnessing performers battle such dense and temporally challenging material. There is a further, more subtle element however; when the Studies are played on a mechanical piano there is a sense that the listener is communing directly with the composer. When a player is involved then a new and powerful personality is inserted into the relationship. For new listeners to Nancarrow this might not be anything of note. But for those who already know the player piano recordings it can, at times, as in the case of Trimpin’s installations, feel like the performance medium is the dominant entertainment. The Arditti Quartet play an important role in the Nancarrow story, his String Quartet No. 3 having been written for them. Their virtuosity is demonstrated on their release “Conlon Nancarrow: Quartets and Studies” (2007), which includes arrangements of some of the later (and supposedly unplayable) Studies: Mikhashoff’s arrangement of Study No. 15, Nancarrow’s own string trio version of No. 34, and Paul Usher’s Nos. 31 and 33 (the latter comprehensively discussed in a paper by Clifton Callender ). 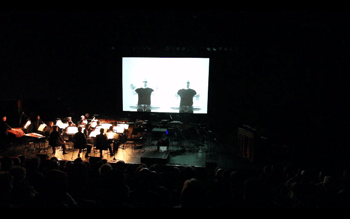 “Impossible Brilliance: The Music of Conlon Nancarrow” took place on April 20th and 21st at London’s Southbank Centre. The concept of the festival was to provide as complete a picture as possible of Nancarrow’s work, and in particular a range of interpretations of the Studies. The key challenge was how best to represent them in their native form. In Paul Griffiths’ exploration of post-war composition, Nancarrow’s main entry interestingly comes under the heading “Homemade Music” (2010, 99–103), a reminder that the Nancarrow studio experience is a key factor. The goal therefore became to metaphorically transport the audience to the studio rather than the Studies to the concert hall. After budget constraints ruled out any physical recreation of the studio itself, the task was to transform the Purcell Room (an intimate and elegant modern wood paneled hall that seats 365) into the studio with minimum materials. The focus then would obviously be the instruments themselves. Trinity Laban Conservatoire of Music and Dance, one of the three main partners in the festival and the author’s primary workplace, is located in Greenwich, London, and by chance very close to the base of Rex Lawson and Denis Hall from the Pianola Institute. It was in part thanks to this proximity that allowed them to be closely involved with the project and support the procurement and restoration of a suitable instrument. After a year and a half of searching, an identical piano to Nancarrow’s was found, a Marshall and Wendell Ampico serial number 105681 built in 1924. Although in working order it still took many months of attention from Rex and Denis to get it to a condition that could cope with the 50-Study assault with a reasonable degree of certainty. The instrument contained the original 90-year-old motor, but as a backup, Rex, to the amusement of some, bought a second-hand vacuum cleaner from a local street market which would be placed in the dressing room, then rigged up a series of tubes and switches that allowed the on-stage operators to turn it on should the main motor fail. 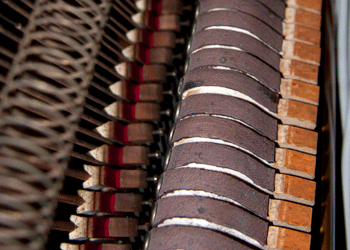 The hammers were prepared with tacks to replicate the tone of Nancarrow’s leather/tacked one. Having procured a workable instrument the next great problem was obtaining the rolls. The only place they can be purchased is from an edition that Wolfgang Heisig has permission to reproduce. These however only include around thirty of the Studies. Apart from the odd roll held privately here and there, the only full collections are owned by the estate of Jürgen Hocker, who died just two months before the festival, and the Paul Sacher Foundation Archive, which owns the originals plus a duplicate set for study/performance. Generously the Sacher Foundation agreed to loan the duplicates that were not obtainable from Heisig. The room was arranged with the player piano center stage with the lid up; the top and bottom doors were removed for sound projection and also for the interest of seeing the mechanism at work. Even though at 365 seats it is a relatively small hall, it was amplified via two condenser microphones placed behind the piano and the volume was set to effectively bring the instrument closer to the audience. It was flanked by the two grands which were unamplified. Pictures of Nancarrow’s studio taken by James Greeson, chosen for their depiction of equipment and not people, were projected onto a screen at the rear of the stage and player piano rolls were hung vertically around as backdrop. Rex and Wolfgang listened to the pieces from a sofa on stage with a symbolic bottle of wine on hand (though it seems Scotch or Tequila would have been more accurate). Example 3 provides a video excerpt from the end of Study No. 37, performed in the Purcell Room in April 2012. In parallel with the player piano preparations was the author’s curation of the London Sinfonietta’s show, destined for the 800-seat Queen Elizabeth Hall. It was agreed early on that it would include three new arrangements for the event: Study Nos. 49a, b and c arranged by John Ashton Thomas, Study No. 26 arranged by Matt Rogers, and Study No. 21 arranged by the author. Each produced different questions in our search for artistic integrity. The least problematic was Study No. 26. A seven-voice canon using only whole notes, it is striking in its contrast with the other Studies. Study Nos. 49a, b and c are subtitled “Excerpts from the forthcoming Concerto for Pianola and Orchestra,” which Nancarrow began after meeting Rex Lawson but, as noted above, they were never formed much beyond the player-piano versions. The first problem was that even though Schott formally published the player piano score, no edition of it is actually available. They did however provide a facsimile version on special request. The second was that it used Nancarrow’s proportional notation, and translating this into traditional notation required measuring the note values with a ruler directly from the paper and then translating them into suitable units. They are represented by Nancarrow in three ways: the distance between the noteheads, the length of a durational line after the notehead, and rapid glissandi that are written out fully with lines indicating the temporal space they fit into. All three are present in Figure 3. Transcribing the recordings accurately is extremely difficult, and almost impossible where irrational tempo ratios are involved. Luckily Trimpin was kind enough to provide his MIDI versions, which made the process manageable. As previously mentioned, there were already two orchestrated versions of this in circulation: Ades’s large orchestra and Disklavier version of Studies Nos. 49 b and c and Paul Usher’s “Nancarrow Concerto for Pianola and Chamber Orchestra,” which is part arrangement, part new composition. (15) Our arrangement was an additional attempt to imagine Nancarrow’s original plan, taking Ades’s version as a guide and incorporating Rex’s pianola as a “feature” if not a true soloistic part. Preparing the click-tracks and electronic parts was highly labor intensive: even with Trimpin’s MIDI version as a blueprint, the accelerando and decelerando were both decidedly lumpy when scrutinized. The solution was the writing of a MaxMSP patch that could generate smooth tempo curves at a given percentage change which could then be used to produce the combined timing map. Example 4 is a video of the complete performance of Study No. 21 by the London Sinfonietta in Queen Elizabeth Hall. The complete Studies performed in the Purcell Room over ten concerts on a Marshall and Wendell Ampico identical to Nancarrow’s. The Studies for two players were performed by Rex Lawson and Wolfgang Heisig on push-up pianolas attached to grand pianos. Mikhashoff’s arrangement of Studies Nos. 5 and 6 played by the London Sinfonietta in the Queen Elizabeth Hall. New arrangements of Study No. 21 by the author, No. 26 by Matt Rogers, and Study No. 49a, b and c by John Ashton Thomas, featuring Rex Lawson on Pianola, also played by the London Sinfonietta. Paul Usher’s arrangement of Study No. 33 played by the Arditti Quartet in the Queen Elizabeth Hall. Studies Nos. 12 and 21 played on Trimpin’s Conloninpurple, installed in the QEH foyer. Studies Nos. 21 and 37 spatialized over a horizontal line array of 12 speakers next to Conloninpurple. Inspired by Sandoval’s versions these were recreated using actual piano recordings made with a Disklavier rather than using samples. The comprehensive program for the festival, included here in the Appendix, provides further context and introduces many of the unique performance issues discussed here. The previous section of this article has dealt primarily with the practical issues surrounding the festival development and the approach taken to the player-piano Studies. This final section briefly explores some of the less familiar questions of authenticity that specifically arise with Nancarrow’s work and his use of the player piano, by noting some of the more familiar critical responses to the mechanical (and electronic) reproduction of music. The purpose in sketching the latter is to identify the broader context of the 2012 London Nancarrow festival, but more specifically to introduce ideas for further deliberation about the dissemination of his music. The player piano is essentially a mechanical means of music reproduction; does this mean that to play a Nancarrow roll is to reproduce a version of the original, even though the original has no other means of playing? This question is what makes Nancarrow’s work specific. Reproducing music mechanically is essentially a twentieth-century invention. It is a century in which, as Schwartz (1996) indicates, the intertwining of authenticity and reproduction emerged: the original was valued and reproductions were perceived as inferior (especially reproduction aimed at a mass market). One example of this new tension is the invention of new means of mechanical musical reproduction (the phonograph as well as the player-piano) coinciding with the emergence of music movements that valued performance with instruments that were historically authentic, despite arguably superior but anachronistic versions becoming available (Arnold Dolmetsch led such a movement in the early years of the century). Popular responses over the succeeding hundred years could, very crudely, be said to embrace the new as reflected in the sales of equipment from phonograph to iPod, waxing and waning as newer technologies superseded earlier ones. Critical responses over the last seventy-five years and more are, unsurprisingly, both “doom laden” and enthusiastic. Of the latter, Stuckenschmidt, writing in the mid-1920s, is perhaps one of the earliest. For him, as Scheinberg (2007, 28) has noted, mechanical reproduction provided composers with the opportunity of dictating their intentions. She observes that Stuckenschmidt urged composers to use mechanical reproduction to supervise the way their works were to be recorded for posterity. Thus the composer could evade the imprecision of musical notation and bypass the performer’s influence on the composer’s works. Nancarrow was first inspired to use the player piano to overcome performer limitations, following a suggestion in Henry Cowell’s New Musical Resources (1966), but he was clearly positive about its no-performer aesthetic. In considering the ‘something’ that is lost at the point of reproduction, he states “One might subsume the eliminated element in the term ‘aura’ and go on to say: that which withers in the age of mechanical reproduction is the aura of the work of art” (Benjamin 1936, 14). The aura of a piece of notated piano music might be said to reside in a combination of the composer’s score and that which a performer brings to a performance. Benjamin notes a fundamental change from theater to film as being the loss of the actor’s opportunity to adapt a performance in response to an audience; film instead creates a new drama that is mediated by editing. This is analogous to the recording of a piano performance for distribution as a player-piano roll. In Nancarrow’s case however the composer’s score was a personalized shorthand from which the rolls were punched. The published scores were only created afterwards and function primarily as study objects, the performance aspect already being complete. With no performer and no traditional score necessary, the aura of Nancarrow’s works is less easily located. The original rolls are imbued with evidence of the composer’s presence: hand-drawn tempo ratios along one edge, Scotch tape repairing erroneous punchings, but these of course are not available for performance. Very few copies of these rolls have ever been made. Approximately half are commercially available, but demand is understandably minimal, so all are rare objects. If Nancarrow himself had made and sold signed copies they might be the equivalent of an artist’s print, but nevertheless when heard on a player piano similar to his, their combined scarcity and comparative novelty may induce a suitably acceptable version of the aura. And even today, under most conditions and even with high-end audio equipment, recordings sound like recordings, not like reanimations of some original acoustic event. That is, one is unlikely to mistake a sound recording, whether analog or digital, for the performance of a live human musician; a recording of a piano, for example, will simply not reverberate in a room the same as the playing of an actual piano. By contrast, a reproducing piano roll generated sounds far closer to those made by the original pianist, whether it was Ignacy Jan Paderewski or a moderately skilled hack working for one of the player-piano companies” (Suisman 2010, 15–16). Kivy (1995) replaces the idea of a single authenticity of performance practice with the idea of there being several, each having its own validity. These include “composer” authenticity, which seeks to be faithful to the composer’s intentions. This is however immediately troubled by Nancarrow’s lack of ambition for his player-piano studies as live concert events. As previously noted he was generally happy to support the idea but made no arrangements for these to occur after the single instance in 1962. The informality of his studio performances are perhaps the clearest example of his intentions, but to continually transport the audience to an imaginary studio is limiting. Another of Kivy’s categories is faithfulness to performance practices prevalent during the composer’s lifetime. There is so little to compare Nancarrow’s practice with during (or after) his lifetime that this is also of little support. What we do have however is evidence of the sonic aesthetic that he wished to convey, which is the third of Kivy’s categories, and we have found that it is highly possible to replicate this. The fourth category is faithfulness to the performer’s own sensibilities. Who is the performer in this case? At the London Festival the style and means of presentation was largely conceived by this author acting as curator, with the theatre of the event being enhanced by the two charismatic “operators.” Using Kivy’s measures, some degree of authenticity is clearly possible, but a search for authenticity is of course no guarantee of an enjoyable event. Richard Taruskin describes the “poeitic fallacy” as “the conviction that what matters most (or more strongly yet, that all that matters) in a work of art is the making of it, the maker’s input” (Taruskin 2004, 10). Thus, those who argue for authenticity, and place a premium on the “original,” or who, with Benjamin, value and seek the “aura,” are guilty of the fallacy in their thinking. They put, according to Taruskin, the composer (and associated professionals, colleagues of academics, and critics) as the sole arbiters of what is to be judged as art and as good music. Anyone else, listener or the untrained, are not merely considered ill-equipped to judge, they are left out of account. The way out of the problem, Taruskin proposes, is to include consideration of “the manner of the way music communicates experience through its particular medium” (2004, 16). Popular music and its adherents have, from the second half of the twentieth century, clearly had no concerns about reproductions lacking authenticity. In fact the reproductions themselves have developed their own versions of authenticity, putting a greater value (both economic and aesthetic) on the older technology—with, for example, vinyl LPs of classic albums often being worth far more now than when they appeared. The “aura” of Nancarrow’s original is tied both to the player piano and the place and time it was written, and it may be argued that it is the lack of original performer that strengthens this bond. Nancarrow’s work, specifically the collection of player-piano Studies, is not only unique in the consistent, innovative, and detailed exploration of temporal structures. It is also his use of the player piano that situates his work in a nexus between the worlds of score interpretation and computer music, between instrumental performance and music that exists only in recorded form. He can be viewed as the first computer composer, with the piano roll as a series of ones and zeros and the player piano as a digital-to-analogue converter. The crucial difference is that this particular digital-to-analogue converter imparts considerable personality at the point of conversion and carries with it the baggage of two-hundred years of music making. Gann (1995) has noted that despite the greater accessibility and immediacy of computerized tools, Nancarrow managed to anticipate many of the problems that arise in computer composition as well as explore many that are still exclusive to him. He was working in an historical period where the player piano was available but the personal computer was not, and it was the very process of overcoming the limitations of the player piano that produced such innovative solutions. That historical window is now firmly shut and recognizing its significance was key to the thinking behind the 2012 festival. Benjamin, Walter. 1936. Work of Art in the Age of Mechanical Reproduction. New York, NY: Prism Key Press, Kindle Edition. Bugallo, Helena. 2014. “Harmonic and Non-Harmonic Temporal Structures in Nancarrow’s Study no. 47 for Player Piano.” Music Theory Online 20, no. 1. Callender, Clifton. 2014 “Performing the Irrational: Paul Usher’s Arrangement of Nancarrow’s Study No 33, Canon 2: Square Root of 2.” Music Theory Online 20, no. 1. Cowell, Henry. 1966. New Musical Resources (with notes and an accompanying essay by David Nicholls). Cambridge: Cambridge University Press. Emmerson, Simon. 2007. Living Electronic Music. Aldershot, UK: Ashgate. Focke, Ed. 2011. Trimpin: Contraptions for Art and Sound. Seattle: University of Washington Press. Gann, Kyle. 2014. “Outside the Feedback Loop: A Nancarrow.” Keynote Address, Online Symposium: Conlon Nancarrow, Life and Music 2012. Published in Music Theory Online 20, no. 1. —————. 2014. “Outside the Feedback Loop: A Nancarrow.” Keynote Address, Online Symposium: Conlon Nancarrow, Life and Music 2012. Published in Music Theory Online 20, no. 1. Griffiths, Paul. 2010. Modern Music and After, 3rd ed. New York: Oxford University Press. Hocker, Jürgen. 2012. Encounters With Nancarrow, trans. Steven Lindberg. Plymouth, UK: Lexington. Kivy, Peter. 1995. Authenticities: Philosophical Reflections of Musical Performance. Ithaca, NY: Cornell University Press. Leitman, Sasha. 2011. “Trimpin: An Interview” Computer Music Journal 35, no. 4: 12–27. Nemire, Julie A. 2014. “Convergence Points in Conlon Nancarrow’s Tempo Canons.” Music Theory Online 20, no. 1. Petrescu, Nicolae. 2008. “Loud Music Listening” McGill Journal of Medicine 11, no. 2: 169–76. Sandoval, Carlos. 2013. “Nancarrow in Twelve Channels” (accessed May 29, 2013). Scheinberg, Erica Jill. 2007. “Music and the Technological Imagination in the Weimar Republic: Media, Machines and the New Objectivity.” PhD diss., University of California, Los Angeles. Schwartz, Hillel. 1996. The Culture of the Copy: Striking Likenesses, Unreasonable Facsimiles. New York: Zone Books. Suisman, David. 2010. “Sound, Knowledge, and the ‘Immanence of Human Failure’ Rethinking Musical Mechanization through the Phonograph, the Player-Piano, and the Piano.” Social Text 102 28, no. 1: 13–34. Taruskin, Richard. 2004. “The Poeitic Fallacy.” Musical Times 145: 7–34. Thomas, Margaret E. 2014. “Conlon Nancarrow, ‘Hot’ Jazz, and the Principle of Collective Improvisation.” Music Theory Online 20, no. 1. Wheen, Natalie. 1990. “Interview With Conlon Nancarrow.” The Journal of the Pianola Institute 3: 10. First broadcast January 18, 1990, BBC Radio 3. Willey, Robert. 2013. “Electronic Realizations of Conlon Nancarrow’s Study No. 37 for Player Piano” (accessed May 29, 2013). Willey, Robert. 2014. “The Editing and Arrangement of Conlon Nancarrow's Studies for Disklavier and Synthesizers.” Music Theory Online 20, no. 1. —————. 2014. “The Editing and Arrangement of Conlon Nancarrow's Studies for Disklavier and Synthesizers.” Music Theory Online 20, no. 1. Alarm Will Sound. 2009. A/Rhythmia. Nonesuch 7559-79933-0. Arditti Quartet. 2007. Conlon Nancarrow: Quartets and Studies. Wergo WER 6696 2. Calefax. 2009. Studies For Player Piano. Conlon Nancarrow. MDG 619 1548-2. Ensemble Modern. 1993. Nancarrow. RCA Victor 09026-61180-2. Icebreaker. 2005. Cranial Pavement. Cantaloupe CA21024. London Sinfonietta. 2006. Warp Works & Twentieth Century Masters. Warp WARP144/. MacGregor, Joanna. 2011. Cage and Nancarrow: Sonatas and Interludes for Prepared Piano, Canons and Studies. Warner Classics 2564-67856-6. Nancarrow, Conlon. 1988. Studies for Player Piano, Vols 1–5. Wergo WER 6907 2. —————. 1988. Studies for Player Piano, Vols 1–5. Wergo WER 6907 2. Schlumpf, Martin. 2004. Die Kunst des Tempokanons. Conlon Nancarrow. Wergo ARTS 81032. * I would like to thank Gillian Moore of the Southbank Centre and Andrew Burke of the London Sinfonietta for their collaboration in making the 2012 Nancarrow Festival possible. I would also like to thank Felix Meyer of the Paul Sacher Foundation, Charles Amirkhanian and Kyle Gann for their inspirational contributions to the event, Rex Lawson and Denis Hall for their advice and generous support with the player piano, Stephen Montague for his personal recordings of Nancarrow and most particularly Yoko Sugiura-Nancarrow and Mako Nancarrow Sugiura for allowing me access to Conlon’s studio and looking after me so kindly in Mexico City. I am especially grateful to Anne Murcott for proof-reading and editing and to the two anonymous reviewers in providing lengthy suggestions and constructive comments on an earlier draft of this submission. Finally I would like to thank Yonatan Malin for his considerable support in developing the article. An even earlier version of this article was prepared as a paper for “Conlon Nancarrow: Life and Music, Online Symposium” September 27th–October 27th 2012 and is published online at http://conlonnancarrow.org/symposium/Program.html. I would like to thank Gillian Moore of the Southbank Centre and Andrew Burke of the London Sinfonietta for their collaboration in making the 2012 Nancarrow Festival possible. I would also like to thank Felix Meyer of the Paul Sacher Foundation, Charles Amirkhanian and Kyle Gann for their inspirational contributions to the event, Rex Lawson and Denis Hall for their advice and generous support with the player piano, Stephen Montague for his personal recordings of Nancarrow and most particularly Yoko Sugiura-Nancarrow and Mako Nancarrow Sugiura for allowing me access to Conlon’s studio and looking after me so kindly in Mexico City. I am especially grateful to Anne Murcott for proof-reading and editing and to the two anonymous reviewers in providing lengthy suggestions and constructive comments on an earlier draft of this submission. Finally I would like to thank Yonatan Malin for his considerable support in developing the article. 1. The festival was initially conceived solely because of the interest the parties had in the composer. The connection with his centenary was only made after planning had begun. 2. It was believed at the time to be the first ever, but it seems that honor goes to Jürgen Hocker in Köln, 1997. 3. The main purpose of the Sacher Foundation is the care of its enormous archive of twentieth and twenty-first century music, housing the manuscripts of Bartók, Reich, Stockhausen and many others. Nancarrow’s complete manuscripts and archived correspondence was acquired by the Foundation shortly before his death in 1997. http://www.paul-sacher-stiftung.ch/en/about_the_foundation.html (accessed 6 January 2014). 4. For a 1962 example, see http://www.youtube.com/watch?v=CAsP8tBlU9k (accessed 29th May 2013). The video was originally released on The Glenn Gould Collection volume 3, recorded 1962, Sony 1990, 6 LD. 5. Letter from Conlon Nancarrow to Monika Furst-Heidtmann 28th July 1980, Conlon Nancarrrow Collection, Sacher Foundation, Basel. 6. Measurements and observations by the author. 7. Only the leather/tack piano is heard on the Wergo recordings as the other was not functional at the time of recording. 8. Conversations between Robert Shumaker, the session’s sound engineer, and the author, October 2012. 9. Letter from Tracy Caras to Conlon Nancarrow 10th November 1982, Conlon Nancarrrow Collection, Sacher Foundation, Basel. 10. See http://www.siba.fi/en/whats-on1/-/events/event/3302 (accessed 29th May 2013). 11. For a greater insight into Trimpin’s work see Focke 2011 and Leitman 2011. 12. See paragraph 27, below, for more on this work. 14. Of these, Study No. 44 needed no synchronization and Wolfgang had already prepared click tracks for two of the others. At the last minute it was discovered that there was no click track for No. 48c. There was no time to acquire the scores, create synchronized clicks with spoken cues at a ratio of 60:61 then mark up the rolls with cue points so the players could maintain sync. In a rapid piece of improvisation a recording was made with 48a in one channel and 48b in the other, lined up to end at the same time, and Rex and Wolfgang heroically agreed to attempt the piece by keeping their rolls in time with the recording. They ended—of course—immaculately together! 15. The Ades version is published by Schott under the title Study in Two Movements. 16. Both were Baldur Brönnimann, the conductor for the concert. 17. On July 3, 1989 Nancarrow responded to a somewhat restrictive set of questions in a letter from Constantine Moschos (who had been asked by Wolfgang Becker to help programme computer controlled films) by saying that the piece is not written yet but will be for pianola and large orchestra. Conlon Nancarrow Collection, Sacher Foundation, Basel. 18. http://www.youtube.com/watch?v=q5bJcMoQRcM (accessed January 7, 2014). The festival was initially conceived solely because of the interest the parties had in the composer. The connection with his centenary was only made after planning had begun. It was believed at the time to be the first ever, but it seems that honor goes to Jürgen Hocker in Köln, 1997. The main purpose of the Sacher Foundation is the care of its enormous archive of twentieth and twenty-first century music, housing the manuscripts of Bartók, Reich, Stockhausen and many others. Nancarrow’s complete manuscripts and archived correspondence was acquired by the Foundation shortly before his death in 1997. http://www.paul-sacher-stiftung.ch/en/about_the_foundation.html (accessed 6 January 2014). For a 1962 example, see http://www.youtube.com/watch?v=CAsP8tBlU9k (accessed 29th May 2013). The video was originally released on The Glenn Gould Collection volume 3, recorded 1962, Sony 1990, 6 LD. Letter from Conlon Nancarrow to Monika Furst-Heidtmann 28th July 1980, Conlon Nancarrrow Collection, Sacher Foundation, Basel. Measurements and observations by the author. Only the leather/tack piano is heard on the Wergo recordings as the other was not functional at the time of recording. Conversations between Robert Shumaker, the session’s sound engineer, and the author, October 2012. Letter from Tracy Caras to Conlon Nancarrow 10th November 1982, Conlon Nancarrrow Collection, Sacher Foundation, Basel. See http://www.siba.fi/en/whats-on1/-/events/event/3302 (accessed 29th May 2013). For a greater insight into Trimpin’s work see Focke 2011 and Leitman 2011. See paragraph 27, below, for more on this work. Of these, Study No. 44 needed no synchronization and Wolfgang had already prepared click tracks for two of the others. At the last minute it was discovered that there was no click track for No. 48c. There was no time to acquire the scores, create synchronized clicks with spoken cues at a ratio of 60:61 then mark up the rolls with cue points so the players could maintain sync. In a rapid piece of improvisation a recording was made with 48a in one channel and 48b in the other, lined up to end at the same time, and Rex and Wolfgang heroically agreed to attempt the piece by keeping their rolls in time with the recording. They ended—of course—immaculately together! The Ades version is published by Schott under the title Study in Two Movements. Both were Baldur Brönnimann, the conductor for the concert. On July 3, 1989 Nancarrow responded to a somewhat restrictive set of questions in a letter from Constantine Moschos (who had been asked by Wolfgang Becker to help programme computer controlled films) by saying that the piece is not written yet but will be for pianola and large orchestra. Conlon Nancarrow Collection, Sacher Foundation, Basel. http://www.youtube.com/watch?v=q5bJcMoQRcM (accessed January 7, 2014).